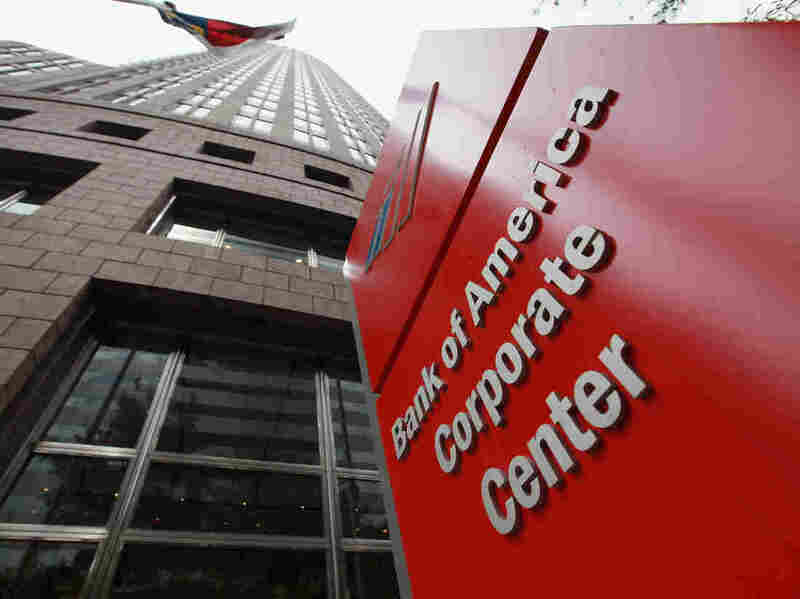 Bank Of America To Pay Fannie Mae $3.6B, Buy Back $6.75B In Mortgages : The Two-Way The agreement resolves claims against the bank about mortgage-backed securities it sold before the housing bust. Many weren't worth what was promised. Also today, BofA and other banks are expectd to settle claims related to alleged foreclosure abuses. Bank of America's corporate center in Charlotte, N.C.
Bank of America announced this morning that it will pay the Federal National Mortgage Association (Fannie Mae) $3.6 billion in cash and will buy back $6.75 billion worth of mortgages to resolve claims related to mortgage-backed securities sold to Fannie Mae by the bank and Countrywide Financial Corp. (which BofA acquired in 2008. As Planet Money has explained before, "during the housing boom, banks sold investors bundles of mortgages that were shoddier than promised, according to lawsuits the federal government" has filed. Now, BofA is resolving the claims against it from Fannie Mae. Word about Bank of America's settlement with Fannie Mae comes as The New York Times reports that "a $10 billion settlement to resolve claims of foreclosure abuses by 14 major lenders is expected to be announced as early as Monday, several people with knowledge of the discussions said on Sunday. ... An estimated $3.75 billion of the $10 billion is to be distributed in cash relief to Americans who went through foreclosure in 2009 and 2010, these people said. An additional $6 billion is to be directed toward homeowners in danger of losing their homes after falling behind on their monthly payments. All 14 banks , including JPMorgan Chase, Bank of America and Citigroup, are expected to sign on." In a statement, Bradley Lerman, executive vice president and general counsel of Fannie Mae, says that "a favorable resolution of this long-standing dispute between Fannie Mae and Bank of America is in the best interest of taxpayers. Fannie Mae has diligently pursued repurchases on loans that did not meet our standards at the time of origination, and we are pleased to have reached an appropriate agreement to collect on these repurchase requests." The Federal Housing Finance Agency regulates Fannie Mae, Freddie Mac and the 12 Federal Home Loan Banks. Its acting director, Edward J. DeMarco, says in a statement that "resolving these issues at this time is in the best interest of taxpayers and reduces uncertainty in the nation's mortgage finance market. This is a major step forward in resolving issues from the past and providing greater certainty in the marketplace, which remain critical FHFA goals as conservator."